A very unique piece created for a collector. Based on designs of ancient Assyrian traditional knives. Working with our client we created our own personal concept. The overall knife is 47cm long with a 27cm blade. 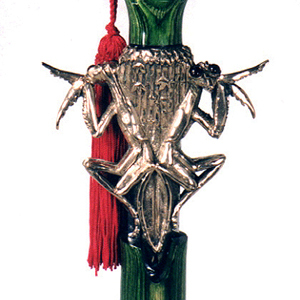 The handle is hand carved from synthetic ivory. The sheath is hand sculpted and cast in bronze. All the bronze fittings and sheath have been plated in 24k gold. The entire piece is adorned with 50 gemstones of lapis, garnet and citrine. The center disc is a representation of the Assyrian flag with a large citrine in the center. Assyrian Dagger is not available for sale. This is an example of custom, limited-edition design. Boarding Axe is not available for sale. This is an example of custom, limited-edition design. We worked with Author Craig Halloran to bring his imagination to life. This is the war ax "Brool" from his "Darkslayer" series. We have drawn up full size renderings and the ax is currently under construction. Brool from Darkslayer is not available for sale. This is an example of custom, limited-edition design. A custom athame designed for a client. Covered in knot work with a black walnut handle. The knife is very large with a 2" wide 10" long blade. 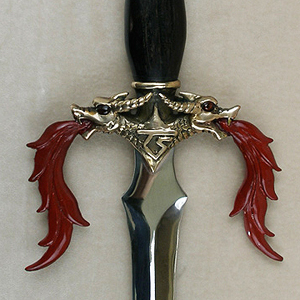 Engraved knot work is on both sides of the blade. Overall length is 18". A custom display case will be made for it to rest in. 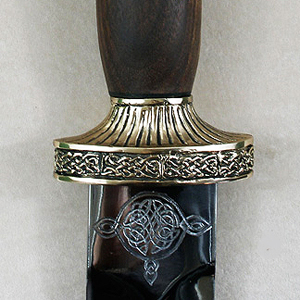 Celtic Athame (Custom) is not available for sale. This is an example of custom, limited-edition design. Dragon Flame is not available for sale. This is an example of custom, limited-edition design. A custom piece created for a client. Based on the design of a dagger of Tutankhamen. We expanded some elements, added others. Working with the client to get the knife they envisioned. Everything is sculpted by hand and cast in bronze. The handle has lapis lazuli between bronze designs. The gemstones are carnelian and jasper. The sheath is lined with black lambskin. Egyptian Knife is not available for sale. This is an example of custom, limited-edition design. Designed and created for the St. Paul Winter Carnival 2013. The lamp is created from sheet brass and has a hatch with a spring catch. Inside are the workings for a mineral smoke machine. Smoke can be produced instantly at the touch of a button. lamp is approx. 14" in length and 6" tall. 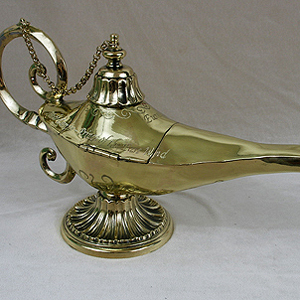 Magic Aladdin's Lamp is not available for sale. This is an example of custom, limited-edition design. 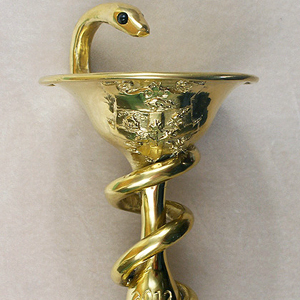 A ceremonial tool used in Zoroastrian ritual. The Mah-Rui are a set. They are individually hand sculpted and cast in solid bronze with silver plating added. Total height is 9"
Mah-Rui is not available for sale. This is an example of custom, limited-edition design. A custom design requested by a client. All the details were thought of by the client and we did our best to bring them into reality. The blade is a Kukri style with wide and sloping downwards. The handle is cast bronze with silver plate and a lapis Lazuli inset. The eyes are manmade sapphire with swiss topaz pears in the hilt. The sheath is oak with leather covering and nickel silver fittings. Wolf Kukri is not available for sale. This is an example of custom, limited-edition design.